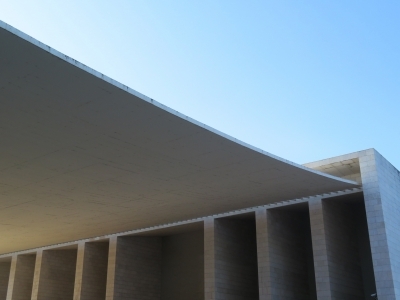 Ensemble of Alvaro Siza's Architecture Works in Portugal is part of the Tentative list of Portugal in order to qualify for inclusion in the World Heritage List. On my last night in Portugal I had booked a hotel in Lisbon, near the airport, just South of Vasco da Gama Bridge. This area is known as Parque das Nações (newly created district, 2012) and its a vastly different area of Lisbon. In this Northeast area along the Tagus River, you can see the massive bridge (longest bridge in Europe). There is also a plethora of venues for music, art, and culture. This is the setting we find Alvaro Siza's "Pavilion of Portugal". In some sense this is New Lisbon, in part a product of the 98' World Expo. The Pavilion itself is quite unique, its design elements have been described with an "enormous and impossibly thin concrete canopy, draped effortlessly between two mighty porticoes." This is an accurate description. My picture partly captures this, but not perfectly. This public venue seems well-used as a musical and cultural space. As I visited the Pavilion, workers were preparing for a large concert. The setting is excellent, the nearby esplanade on the water and museums all made a fine area to walk. 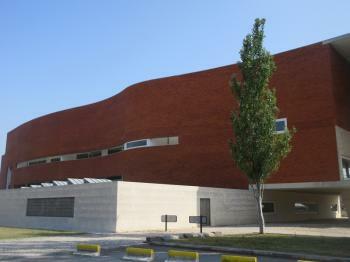 For any architectural enthusiast, this site and other works by Alvaro Siza should be interesting. A living modernist architect of whom's work spans seven decades, perhaps this can be seen as exceptional? Driving the most popular motorway Lisbon-Porto we made a quick detour to see the university campus in Aveiro, especially its library building, placed on Portuguese T-List. The library, according to the description of the proposal, is one of the best examples of Alvaro Siza's architectural style. I am not familiar with modern architecture and I have not heard about Alvaro Siza before, but I liked the library building and the whole campus. In style and atmosphere it is so different from (not so distant) University of Coimbra but if I was a student again, I might consider these two places equally. I am not aware how many buildings of the Aveiro University have been designed by (or in cooperation with) Alvaro Siza, but the library building is similar in style to all other edifices of the campus. The library building can be seen from outside, taking photographs is not allowed inside (and as a visitor you can only enter the lobby). Although all my family liked the visit, being ignorants in modern architecture we could not understand the potential outstanding universal value of the place.